My first sunset in Botswana blew me away. I loved the vivid colors and the feeling that I was witnessing perfection. I’ve seen many beautiful sunsets in my life, but I will never forget this one and how I felt. This entry was posted in Africa, Travel, Travel Photos and tagged Africa, Botswana, Chobe National Park, Nature, Photography, Photos, Sunsets, Travel, Travel Blog, Travel Journal, Travel Photo, Travel Photos. Bookmark the permalink. Excellent photograph! I love the lighting. Maybe you should consider participating in our Be Inspired Project? It’s a project dedicated to inspiring individuals around the world one photograph at a time. Here is our blog post for more information about the project: http://www.hellosunshinephoto.com/2012/03/29/be-inspired-photography-extravaganza/ We would love for you to join us! Thanks Antonette. I’ll check out your blog–it sound like a fun project. 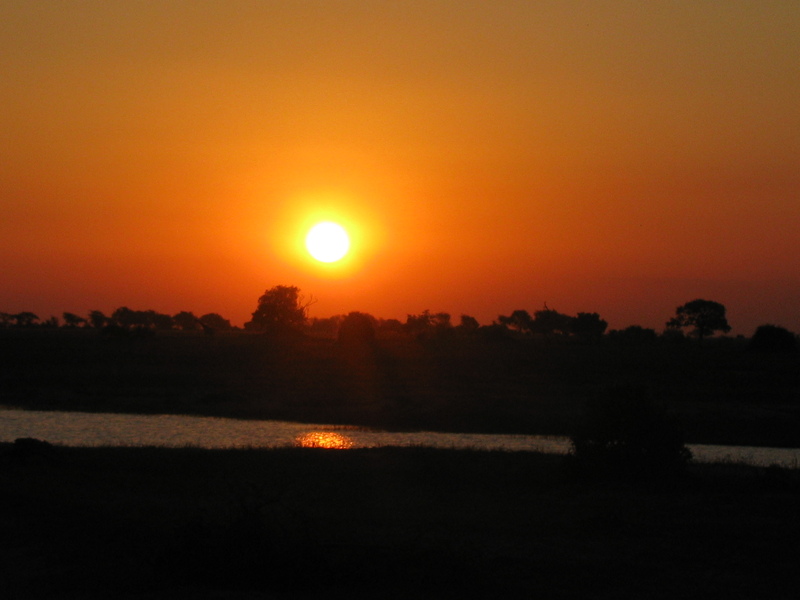 One of my favourite thing about Africa, the sunsets… I hope you enjoyed your time there? Amazing! It must have taken your breathe away. Now I am wondering. That is a fascinating thing to ponder. Thanks Nia! Wow, what a vibrant, warm sunset! Beautiful! Oh the colors blew me away. Yes it is…we are so lucky today. Digital cameras have really made my life so much easier. Great photo TBM, like it! I like the reflection in the water. It was a nice touch to the whole scene. ow…you are so lucky to see that and capture it. I feel very lucky Novroz. I don’t think I’ve ever seen a sunset where the entire sky is orange like that. Gorgeous. It was like that each night. I loved it! Now that is absolute perfection indeed. What a great capture. Thanks Myra…It can’t get much better.